ExpandDecider subclass which restrict terms to a particular prefix. 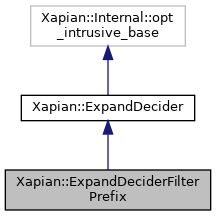 ExpandDeciderFilterPrefix provides an easy way to choose terms with a particular prefix when generating an ESet. The parameter specify the prefix of terms to be retained. Do we want this term in the ESet? term The term to test.